A scenic elegant overlook of city lights views through a beautiful bay window. There is some nice color in the sky as the lights shine on. 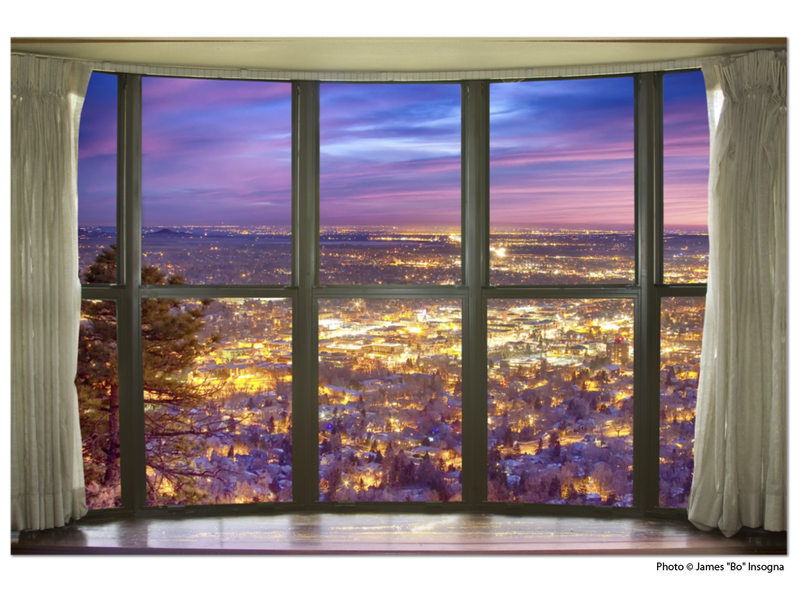 Create a fine art photography optical illusion to your decor of living up high on a mountain with city lights right out your window. Your very own private fantasy window view. A scenic elegant overlook of city lights views through a beautiful bay window. There is some nice color in the sky as the lights shine on. Create a fine art photography optical illusion to your decor of living up high on a mountain with city lights right out your window. Your very own private fantasy window view. This is an incredible way to decorate your office walls, home walls, cafe, restaurant, boardroom, waiting room, trade booth, corporation or almost any commercial space. Special Price – Premium Canvas Wrap ready to hang with FREE SHIPPING! USA Only. Have a window idea in mind. Let us custom one for you choose the images from our gallery. Contact Us! Windows with a view fine art nature landscape photography prints and stock images by James Bo Insogna (C) – All Rights Reserved.